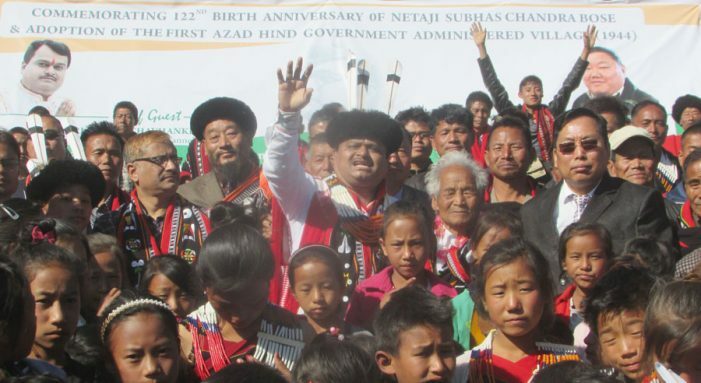 A Delhi based news channel on Wednesday adopted Ruzazho village under Phek district of Nagaland commemorating with the 122nd birth anniversary of Netaji Subhash Chandra Bose. The village is claimed as the ‘first Azad Hind government administered village (1944)’. aking the formal announcement of the adoption of this village under its Corporate Social Responsibility (CSR), Sudarshan News Channel chief managing director and editor-in-chief Suresh Chavhanke said that with the adoption, the Sudarshan Rashtra Nirman Trust would endeavor to bring about all round development for this remote village. He asserted that the Trust would pursue with the central government for bringing about funds for development of roads, converting the village into Heritage Village, developing the house where Bose stayed at Ruzazho into a national museum and also bring about Eklavya School into the village, according to a report. He announced that the Trust would work towards transforming and equipping the village with modern facilities and also connecting it with the mainland through social media and information technology. He said it would also move for granting of pension to those who helped Bose during his stay in this village. Chavhanke announced that his channel would endeavour in providing job avenues in the metropolis for the interested youths of the village and also provide free training to one male and female youth each in pursuing journalism. Asserting to turn this village into Digital Ruzazho, he said it would provide free wi-fi and also construct helipad for better connectivity.